Samuel von Brukenthal (1721, Nocrich - 1803, Sibiu) was the Habsburg governor of the Grand Principality of Transylvania between July 6, 1774 and January 9, 1787. 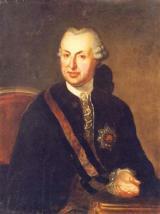 He was a baron of the Holy Roman Empire, and personal advisor of Empress Maria Theresia. His home, a large palace in Sibiu, is currently home to the Brukenthal National Museum (formed around the collections he gathered, and expanded from a public exhibit first opened in 1817). Samuel von Brukenthal was born on 26. July 1721 in Leschkirch (Nocrich), between Sibiu and Agnetheln. His grandfather and father had been royal judges. He started the construction of the palace a year after being elected governor of Transylvania (1777). The major difficulty in the construction of the "new house" consisted in the obligation to keep to the two demolished lots, the church and the Jesuit seminary. Unlike palaces surrounded by parks, the edifices built in the interior of the medieval towns are strictly limited to the existence of the initial lots. The palace built by Samuel von Brukenthal has a rectangular foundation, enclosing an inner courtyard. The access to the palace and to the courtyard is made through a portal situated in the axis of the narrow side, towards the front of the street. The Brukenthal Palace in Sibiu represents one of the Baroque treasures in Central Europe. The construction of this imposing edifice had as no purpose, from the very beginning, the creation of a propitious background for the conservation of an art collection and of antiquities having an inestimable value. There was not only the palace named by him, also a school which is situated near the palace, right across the Protestant Cathedral. Samuel von Brukenthal is the oldest German school in Romania. The school was mentioned the first time in 1380. The present building was erected in the 18th century. The school is named by the former governor of Sibiu and the lover of Maria Theresa of Samuel Brukenthal. The Samuel von Brukenthal Gymnasium (Sibiu, Romania) is a school with instruction in the language of the German minority. The school is still one of the best schools in the country. The language is still German, Romanian is only taught as a foreign language. After the turn, and the exodus of the Transylvanian Saxons, the majority of students are Romanians.